ON THE PARIS UNDERGROUND. A train entering the station of Place d'Italie. The first section of the Paris Metropolitan Railway was opened in 1900 from Porte Vincennes to the Porte Maillot. The line is electrically operated at 600 volts dc. Nearly all the stations are near street-level. PROBABLY the first underground railway that the average traveller in Europe is likely to see is the one in Paris The visitor will be struck by its extreme simplicity. There are no lifts, escalators, or visible station buildings. A short flight of steps leads down from the pavement to a passage containing the booking-office, which is in charge of a woman clerk. Farther along the passage and opening on the platform are some one-way gates, where another woman, in overalls, glances at the tickets. The two-track tunnels run just under the street-level, the girders of the street above giving them a square appearance. The trains are neither so fast nor so frequent as those of the London Underground. The Paris Metropolitan Railway, known locally as the Metro, has a route mileage of eighty-two. It is an amalgamation of two concerns, the Metropolitan proper and the Nord-Sud. The ten lines of the former and the two lines of the latter were amalgamated in 1930. 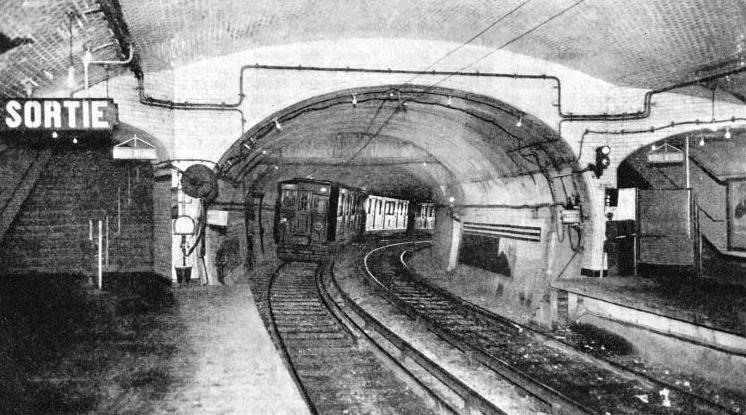 The whole of the system has come into existence since 1900, when an east-west section was opened, running from the Porte Vincennes to the Porte Maillot. The company works the line under the jurisdiction of the City of Paris, which shares in the receipts. There are two classes, for either of which a uniform fare is charged, permitting unlimited journeys throughout the day. The ordinary fare is 70 centimes, and the first-class fare about one franc. With the franc at 75 to the £, these fares are equivalent to about 2d and 3d respectively. Before nine a.m. an ordinary return ticket may be bought for 85 centimes. No season tickets are issued; but passengers may obtain carnets, or little books of ten tickets, thus saving time in the rush hours. The first-class cars, painted scarlet, are to be found in the middle of the trains. All the rolling stock and equipment is provided directly by the company. No smoking is permitted anywhere in the train. The carriage doors are not pneumatically operated. All the trains stop at every station. The stations are not elaborately decorated. The French are severely practical. A hundred thousand people, they say, will pass through a station every day, but none will linger. They have, therefore, built their stations sufficient for ordinary comfort, and eliminated superfluous decorations. Moreover, the Metro deals safely with an enormous passenger traffic without adopting the elaborate safety-devices of the London Tubes. In 1932 the Metro carried over 863 million passengers. On the map the Paris Metro looks even more involved than the London Tube system. None of the lines keep straight; they turn again and again at extraordinary angles. With their interchange system, however - and at some points even three lines will meet - the net result is to plot out Paris into a series of small intersecting circles, with no point more than a quarter of a mile or so from some underground station. In short, the passenger who does not mind a series of changes can go from anywhere to everywhere on the system. 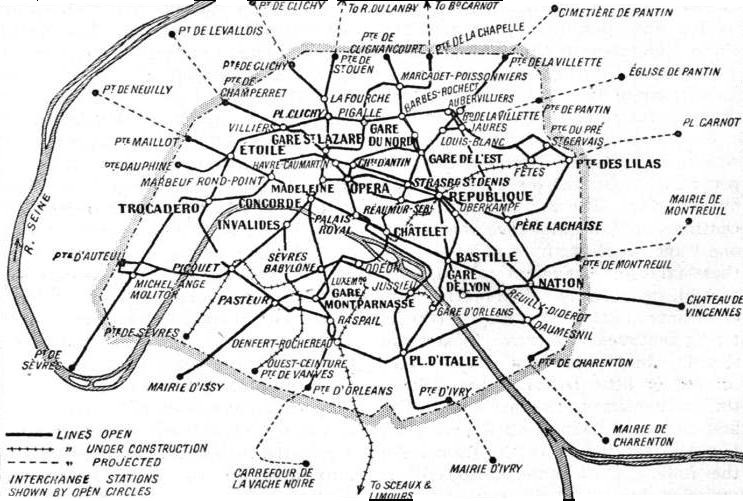 THE DENSE NETWORK of the Paris Metropolitan Railway is shown on the above map. In one year the railway carried over 863,000,000 passengers. There are some eighty-two miles of 1·44-metre gauge track. The company owns some 1,361 trailer cars and 1,340 motor vehicles. Paris has its elevated railway in the Ceinture or girdle system, running on a kind of unending viaduct. The Grande Ceinture, or outer girdle, encircles Greater Paris. Its route mileage is ninety-one. It is mainly used by long-distance and through trains. The Petite Ceinture, or inner girdle, with a route mileage of twenty, links up most of the main-line termini of Paris. It is used by through carriages from one main-line system to another. The Ceinture railway was an independent company with its own locomotives and rolling-stock. The company possesses among its 161 locomotives a Diesel-electric engine recently introduced for shunting. Rolling-stock is supplied by the main French lines. New York is equipped both with underground and with elevated railways. In America the underground is invariably called the “subway”. In Great Britain the term is not used in this connotation, except in the title of the Glasgow District Subway. London once had a Tower Subway, a narrow-gauge cable-tramway under the Thames. To an American ear “Underground Railway” (or “Railroad”) has a specialized meaning. In the eighteen-sixties, just before the American Civil War, the smuggling of escaping slaves from the South to the North was known as the “Underground Railroad”. The routes were called “lines”, the people who helped “conductors”, and the escaping slaves “packages”. New York has three distinct systems of subways; the I.R.T., or Inter-borough Rapid Transit, the oldest system; the B.M.T., or Brooklyn-Manhattan-Transit; and the Municipal subways built by the city. Each of them has numerous lines, and they cross and criss-cross under Greater New York, penetrating all its five boroughs. Manhattan, the Indian name of the island that most English think of as “New York”, is the central part with most of the famous buildings and streets. The subways run up the island and cross the Harlem and the East Rivers - sometimes by tunnel and sometimes by bridge. It is possible to travel for many miles, all for five cents, or about twopence-halfpenny. New York has no real tube railways. London is built on clay, so that it is comparatively easy to cut down a hundred feet or so, and then bore a tube, but Manhattan is solid rock. The Americans blast out a street with dynamite, lay their subway, and then cover in again above it. At intervals in the “blocks” comes a station; it is a short flight of stairs down from the pavement. The passenger drops a coin into a slot, passes a turnstile, and reaches the platform. No tickets are issued, single or return. There are no first-class cars, and no smoking is allowed, even in the passages leading to the station. Most of the subways have four tracks - two for slow and two for express trains. On the Lexington Avenue line, for example, the expresses will not stop between 42nd and 96th Streets; four intermediate stations are passed. The New Yorker will leap out of his slow train, dash across the yard or two of platform, and fight his way into the non-stop. In the rush hours the New York subway is crammed to repletion. New York is a democratic city, which means that everybody leaves work at approx-imately the same time, with bankers, clerks, workmen and typists all fighting hard to get near their trains. And the demo-cratic subway attendants will put their backs against the fighting crowds, and will literally push the last perspiring banker into the packed car before they can get the gates to close. That is why the I.R.T. subway is plastered with advertisements begging the traveller, as a favour, not to use it, but to book instead on the Elevated, or “L”, as it is colloquially known. That, too, belongs to the Interborough Rapid Transit, and with the same five-cent fare, the Company obviously makes no loss of revenue, and at the same time relieves its overcrowded subways. But the elevated takes generally longer and the New York citizens prefer to use the subway although it is more crowded. The Elevated is a railway running on giant stilts above the main road. The first section was opened in 1878, and began as a steam line. It had no signals in those far-off days, and engines drove “at sight” and stopped when they saw a train in front; there were not many trains, and they did not go very fast. But the steam locomotives must have been a nuisance in the early times. To-day, of course, the lines are electrically operated. The Liverpool Overhead, which is a copy of the New York “L”, began (in 1893) as an electric railway. No more “L’s” are being built, and those that exist are said to be doomed. There are four Elevated lines in Manhattan itself, with more across the East River in Brooklyn. There are the 2nd and 3rd Avenue lines on the East Side, and the 6th and 9th Avenue lines on the West Side. The famous Fifth Avenue is the dividing point in New York’s geography, with East and West on either side of it. In New York “up-town” and “down-town” have opposite senses to the meanings of English words; in Manhattan “downtown” is the business part at the bottom end of the island, and the New Yorker goes home “up-town”. The four lines of the “L” join one another, split off into branches, turn themselves into subway lines, and become generally involved. Express trains are run with the help of a third track. This centre track takes “down-town” expresses during the morning rush-hours, and then turns itself into an “up-town” non-stop line in the evening. It is connected with the other lines by means of flying and burrowing junctions. These are so frequent that the stranger feels as if he were on a switch-back railway. Seen from the street level, trains sometimes seem almost to be climbing over one another’s backs. While we are dealing with the elevated and underground railways of New York, we ought not to forget the Hudson Tubes. There are two great rivers round Manhattan Island, the East River and the Hudson, to say nothing of the small Harlem River. There are bridges over the East River even at its widest, but the Hudson is so much wider that no bridge is possible for a long way up. The Hudson Tubes were built instead. They must not be confused with the Holland Tubes, which are under-river tunnels built by an engineer called Holland for motor traffic. The Hudson Tubes are for railways. They belong to an independent company unconnected with the subway systems. There are four Hudson Tubes, and they run as far as Newark, in New Jersey. There is no uniform fare. As much as the equivalent of eighteen-pence can be paid for a single journey. 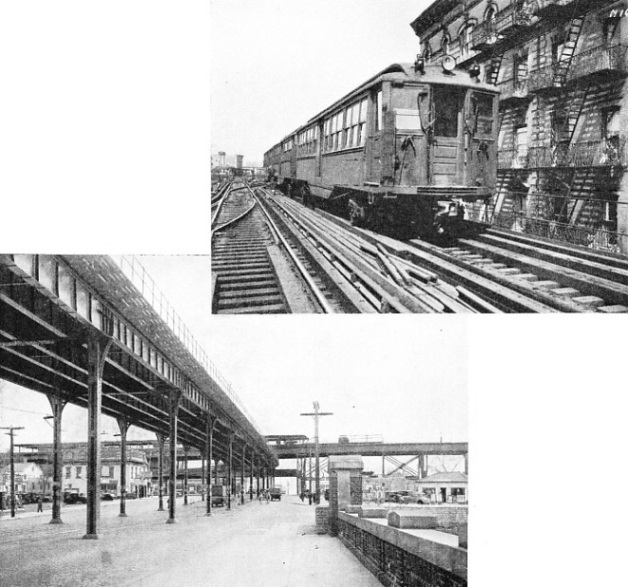 Subways and elevated railways exist also in Boston, Philadelphia, and Chicago. The famous Chicago “Loop” owes its name to the local “L”; it is the part of the city circled by the Elevated, and of course it is the business and finance part. Chicago once had a famous gangster murder on its subway. That was in 1930, and the murdered man was a Mr. “Jake” Lingle. The murderer chose a rush hour, and escaped unnoticed in the crowd. THE NEW YORK ELEVATED was first opened in 1878, and was then steam operated and had no signals. To-day the line is electrified, and express trains are run on it by means of a third centre track. The Elevated lines belong to the Interborough Rapid Transit, which is one of New York's three systems of subways. The upper photograph shows a typical train on the Elevated. shows how the track is carried above the streets. Chicago boasts a purely goods subway, which is probably unique. The construction was the idea of one of the private telephone companies that operate in the States. It had to lay its tens of thousands of wires somewhere, and, with overhead lines forbidden in the streets, it was obliged to build tunnels for them. The idea occurred of making them large enough to take small freight trains. Why drive the people underground? said the company. Drive the goods underground, do away with the street lorries, and let the people have the benefit of clearer streets. The line was built to connect with every great warehouse; this also runs along the basements of the skyscrapers, and brings them the coal for their furnaces and takes away their refuse. With the coming of the motor, however, traders were unwilling to unload their stuff and then pack it again on the subway cars; and Central Chicago to-day is almost as overcrowded as ever. The American lines operate on the third-rail principle Many of the continental underground railways derive their electric power from an overhead wire or wires. At Oslo, the capital of Norway, there is an underground railway which began as a country line. It originally connected Holmenkollen and Frognersaeter, two mountainous pleasure resorts close to the capital. Recently the company thought it would benefit by picking up its clients in the middle of the city. The line was extended underground, and a station was built under Oslo's National Theatre. Passengers may now travel from the heart of the city to the top of the little mountain park in thirty-five minutes. Vienna has an underground railway which takes a most irregular course. It was built for strategic purposes in the days of the Austro-Hungarian Empire, and linked up the various military and police barracks. Passenger traffic was a minor consideration. The Metropolitana of Naples starts underneath the Central Station and has a route-mileage of about twelve. There is a half-hourly service of little trains resembling tramcars, having two classes. The Metropolitano of Madrid has two main lines and a branch line. Buenos Aires, in South America, has an underground line running from the Plaza do Mayor; in the section near the docks it carries goods as well as passengers. The interesting feature of the Elberteld-Barmen Elevated Railway is that, instead of running on rails, it hangs from a rail. Berlin has numerous underground and elevated railways. Several years ago it built its Stadtbahn, or City Railway. This began as a connecting link between the main lines from east to west, but it was soon extended as a purely local line. The Berlin Underground, or U-Bahn, was opened in 1923. In 1926 the Municipality of Berlin acquired a controlling interest. In 1928, after a working agreement had been made between the elevated and underground railways, the tramways, and the omnibus companies, the three companies were amalgamated and formed into the Berlin Transport Company. The railway route mileage is fifty. The uniform fare on the Underground is twenty-five pfennigs (nominally 2½d). The Budapest Underground - really in Pest, on the east side of the Danube - resembles a tramway subway rather than an underground railway. Tokyo, capital of Japan, has an underground railway. The underground railway at Sydney, Australia, is not of any very great extent, having been recently built merely as a relief to the suburban traffic of the mainline railways; it was then, for convenience, carried underground through the centre of the city. It runs round in a loop, with low-level platforms underneath the great Sydney Station. An oddity exists in Hamburg in connexion with the Hochbahn, which means the “high” or elevated railway. For several stations the “elevated” is running underground. A similar anomaly exists in the USA. When Boston City had finished the building of its new subway the corporation leased the line to the Boston Elevated Company. The “L” lines, now gradually being abolished, were the earlier, and so in several instances the newer subways are part of “Elevated” systems. In the great cities of America this plan of lease is common. The subway is looked upon as an absolute necessity of life in the crowded centres; its construction cannot possibly pay commercially, and no private company could consider the venture. The city will, therefore, build the subway line itself, and will charge up the costs to rates and taxes. It will then often lease it out to some company to work. In Chicago the “L” systems alone in one year carried 226 million passengers, while in Philadelphia the North Broad Street Subway cost the city one hundred million dollars, or roughly £20,000,000, to construct; its working was then leased to the Rapid Transit Company. Fares vary with the different cities, and with the terms on which the systems were laid down. In New York it is possible to take a direct subway run of twenty-two miles in one direction for five cents, or twopence-halfpenny. The fare is not sufficient to cover expenses economically, and the city has to make up the loss. THE JEROME AVENUE LINE on the New York Interborough Rapid Transit system. On this system there are 138 miles of elevated track and 263 miles of subway, the track is all electric, and of the 4 ft. 8½-in gauge. You can read more on “Chicago’s Unique Underground”, “Elevated and Mono-Railways” and “Moscow’s Underground” on this website.